(10:00:20)*qlw5与所有人说:Good morning, Jim, so long without contact with you. (10:49:10)jjcao1231与所有人说:we can not find anything in P22. (11:19:52)jjcao1231与所有人说:how can we get the image on P22. I'm very interesting. (11:23:26)*eagle_yj与所有人说:i like the princeples of APM, but how can we measure the goodness of process of APM? (11:28:41)jjcao1231与所有人说:Is there any software(tool) supporting process of APM ? (11:30:26)*qlw5与[*umlchina_seminar]说:Jim, how do you think about the open source in APM? (11:31:55)ASD与所有人说:how do you compare your ASD book and APM book? (11:32:58)*qlw5与[*umlchina_seminar]说:follow ISO9000 and CMM, do you think APM can help us? in what kind of aspect? (11:36:24)jjcao1231与所有人说:Can we stride over unified process? We are small company, but our manager like RUP2000. 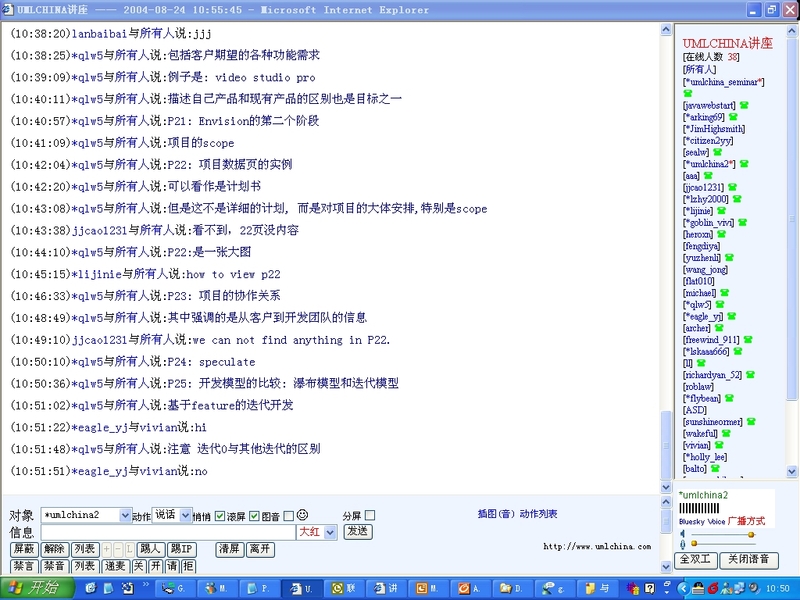 (11:36:46)jjcao1231与所有人说:He believe XP is not suitable to Chinese. HOw do you think? (11:39:38)*umlchina2与*JimHighsmith说:developers to the less important side, such as MDA, and IBM's eclipse these days? (11:45:26)ASD与所有人说:a very casual question:how do you balance your work and life? (11:45:45)ASD与所有人说:you know,China and USA is very different. (11:47:20)ASD与所有人说:a friend of mine is thinking about departing her husband.hehe.because of his hardwork. (11:48:10)*JimHighsmith与所有人说:balancing home and work is very important. (11:48:23)*JimHighsmith与所有人说:balancing home and work is very important. (11:48:53)*JimHighsmith与所有人说:I'm a little older, 58 years, so I've had to learn that balance over time. (11:49:06)yuzhenli与所有人说:Like European, Enjoying life is most important. (11:49:33)*JimHighsmith与所有人说:Yes, I love to hike, ski, mountain bike. (11:49:52)*JimHighsmith与所有人说:No, it's a very important question. 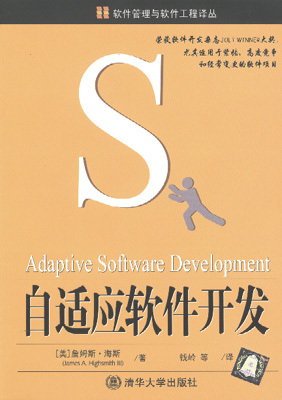 (11:50:10)*JimHighsmith与所有人说:agile development stresses sustainable development. (11:50:31)*JimHighsmith与所有人说:not working so many hours that everything else suffers. (11:51:09)*JimHighsmith与所有人说:Thank you all for your participation. I have enjoyed the session. (11:51:26)yuzhenli与所有人说:How to orgnize the team is an art. (11:51:26)*JimHighsmith与所有人说:Maybe one day I will come to China in person! 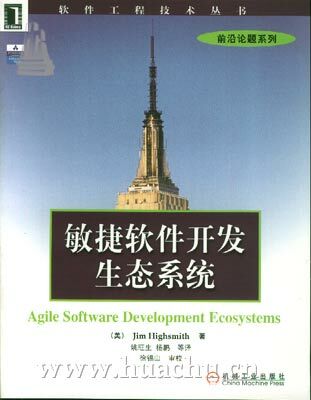 (11:51:55)*JimHighsmith与所有人说:yes, the art of project management. (11:53:02)yuzhenli与所有人说:Could you give me your email, JimHighsmith? (11:55:04)*umlchina2与*JimHighsmith说:Do you watch the olympic matches these days? (11:56:48)ASD与所有人说:mountain hike is very popular in US. (11:58:47)*JimHighsmith与所有人说:Thanks and I will close now.